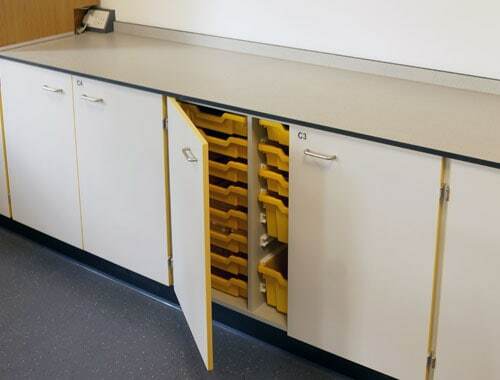 Klick were appointed to carry out a full refurbishment of the biology department. Their designers suggested an interesting use of colour and offered a number of layout options. Work commenced at half term and continued through the summer term on an agreed rolling programme, avoiding disruption to staff or students. Their site staff were professional and any issues were quickly addressed. We are delighted with our smart new labs and I would have no hesitation in recommending Klick to other schools. The school wanted to revamp their biology department over a three-stage programme of works. The college stressed the importance of designing labs that would have the same look and feel as their existing laboratories, in order to create a sense of cohesion between the three scientific disciplines. The Klick design team created layouts that worked for the space available. Cranked benching was used where space allowed, however, one lab was smaller than the others and as a result straight island benches were installed. Our designers used colour to add vibrancy to the space. Contrast door edging, end panels and trays all add touches of colour to the rooms. 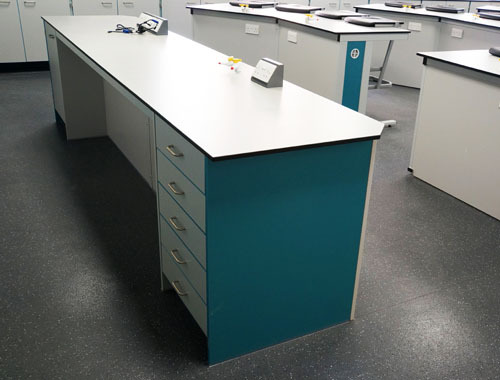 The turquoise, purple and yellow colour schemes make each lab individual and more welcoming for students. The school took advantage of our term time discount. The majority of the more disruptive work was completed during the students’ half term and then the installation continued on through term time. Our fitters liaised with the site staff and minimised disruption to staff and students.